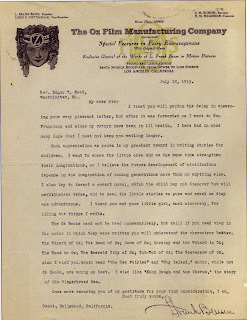 On July 18, 1915, L. Frnak Baum, author of The Wizard of Oz and its sequels, responded to a letter he received from Rev. 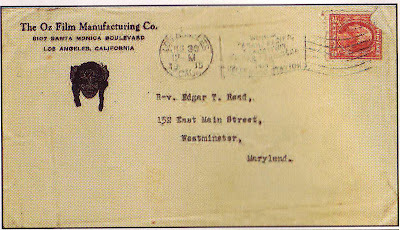 Edgar T. Read of Westminster, MD. Within, Baum relates his aims and hopes for the Oz books. "Such a appreciation as yours is my greatest reward in writing stories for children," he writes. "I want to amuse the little ones and at the same time strengthen their imaginations, as I believe the future development of civilization depends on the imagination of coming generations more than anything else. I also try to insert a covert moral, which the child may not discover but will nevertheless sense, and to keep the little stories as pure and sweet as they are adventurous.."
"The Oz books need not be read consecutively, but still if you read them in the order in which they were written you will understand the characters better. The Wizard of Oz; The Land of Oz; Ozma of Oz; Dorothy and the Wizard in Oz; The Road to Oz; The Emerald City of Oz; Tik-Tok of Oz; the Scarecrow of Oz"
-- and expresses what appears to be a degree of frustration that his other books for children have not received the same attention, despite his belief that they are as good if not better than the Oz books. "Also I wish you would read The Sea Fairies and Sky Island, which, while not Oz books, are among my best. I also like John Dough and the Cherub, the story of the Gingerbread Man." 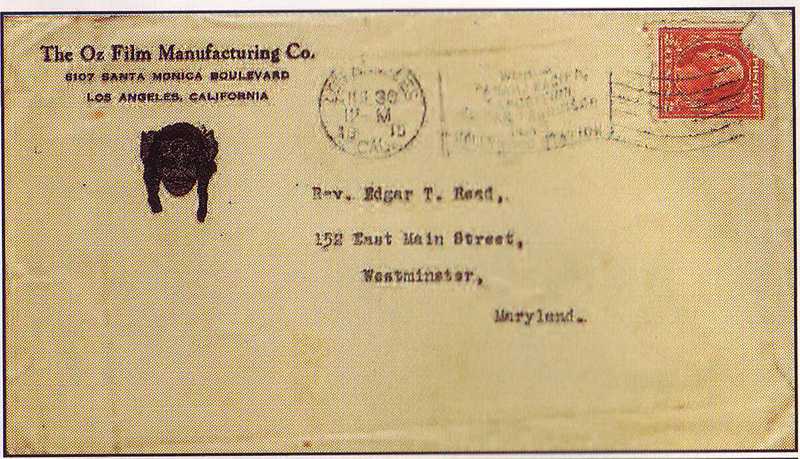 Of particular note is that this letter is written on letterhead of The Oz Film Manufacturing Company, "Special Features in Fairy Extravaganzas with Original Music," a venture, with Baum as President, whose intent was to provide wholesome, enjoyable, and non-violent movies for children that, alas, survived only two years, 1914-1915. Westerns, at the time the most popular and lucrative movie genre, were considered to be too violent for kids. But not by kids. Though a critical success, the production company was a commercial failure. The Patchwork Girl of Oz, one of three Oz books adapted by the studio (with "Original Music"), didn't pack a six-shooter. 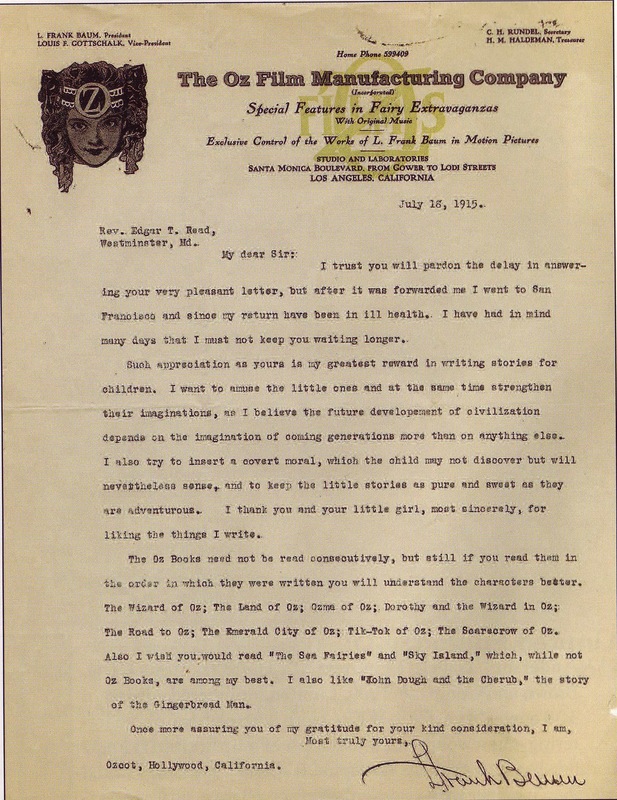 L. Frank Baum, visionary, battling Hollywood's indifference to appropriate film fare for children: He had courage. He had heart. If he only had a brain. Images courtesy of Jo Ann Reisler, Ltd, with our thanks. They are offering this spectacular and revealing piece of Oziana for $7,500. Interesting-- I didn't know Baum wrote anything other than the Oz books. The Bard Or Not the Bard? That Is The Question. Italian Big Cheeses At Home In L.A.